Mexico’s historic energy reforms are now in focus with a change in administrations on the way. Andrés Manuel López Obrador (AMLO) won a landslide victory in Mexico’s presidential election on Sunday, and appears poised to win majorities in both houses of Congress, granting him sweeping power to remake the country. His party, Morena, also won a large number of governor’s races and AMLO’s former environment minister from when he was mayor of Mexico City followed in his footsteps and won the election for mayor in the capital city. The Mexican people, fed up with widespread corruption, poverty and violence, have handed AMLO a stronger mandate than any Mexican president in decades. AMLO has long supported a nationalistic outlook on energy, and spent years criticizing the liberalization of Mexico’s energy reform. He repeatedly said that he would halt future auctions of Mexico’s offshore oil and gas reserves, while also promising to investigate already-awarded contracts for cases of fraud. AMLO’s election has the oil and gas industry on edge, which fears that a swing to the left imperils its investments in the country. The majorities in Congress for AMLO’s Morena party could also neuter the strongest checks on his power. AMLO has also suggested he would curtail or even end crude oil exports, diverting supplies for domestic refining. 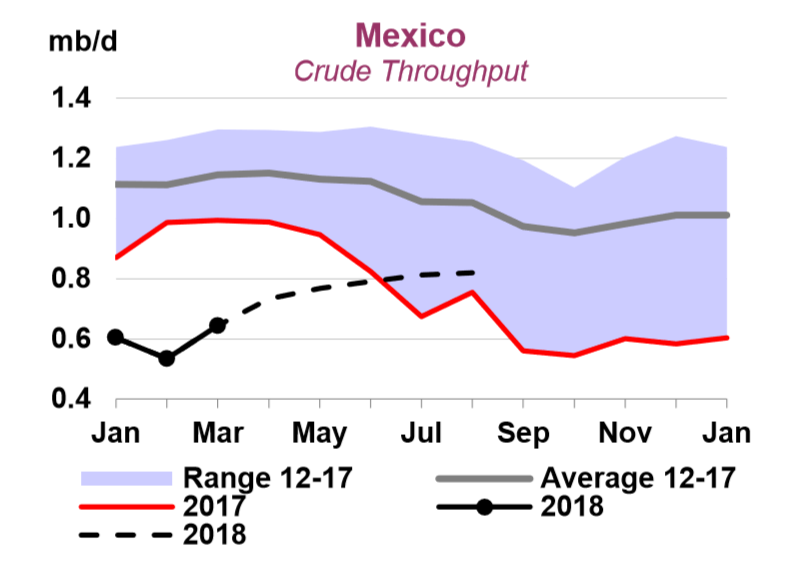 Mexico’s aging refineries are operating way below capacity, and Mexico has become increasingly dependent on imported fuel from the United States. As a result, AMLO wants to spend billions on building a handful of new refineries while upgrading older ones. This strategy, he argues, would cut Mexico’s dependence on foreign fuel and help build up capacity in value-added refined fuel production. But even more modest sums will be too much for state-owned Pemex, which is stretched because of poor management and very significant debt. As such, Mexico needs international companies to take on the burden of heavy expenditures. With enticing offshore reserves, the oil majors such as Shell, Chevron, ExxonMobil and Eni appear willing to do just that. However, state control of the nation’s energy reserves is a point of pride for Mexico, dating back to the nationalization of the oil industry in the late 1930s. President Pena Nieto’s privatization was controversial when it passed years ago, and the promised fruits of the overhaul have not been felt by the average person. That gives AMLO leeway to slow-walk permits and suspend future auctions, while working to put Pemex back in control where he can. AMLO also seems supportive of reinstituting price controls on fuels to blunt the impact of higher oil prices on the public. Pena Nieto removed fuel subsidies in early 2017, which led to a spike in gasoline prices and prompted widespread protest in what became known as the gasolinazo. Expensive fuel is not popular anywhere, and AMLO has signaled his intent to return to price supports, even if it comes at huge public expense. He had also suggested a national referendum on the energy reform, and ultimately a change in the constitution to wipe out Pena Nieto’s changes. At the same time, he dialed down this rhetoric during the campaign, attempting to reassure investors that their money was safe. Needless to say, there is a lot of uncertainty about what to expect from an AMLO administration. But his overwhelming victory could embolden him to pursue a more aggressive course of action…whatever that may be.